One day I’ll do it. One day I’ll buy some macaroons at the best places in Paris and organize a macaroon tasting. 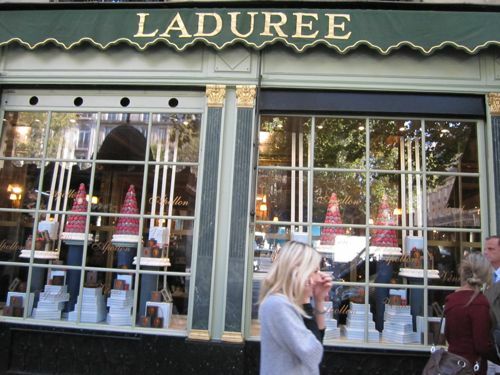 But until today I consider Ladurée as the best place to buy macaroons in Paris. Maybe some flavours taste better elsewhere, maybe Pierre Hermé’s chocolate macaroons are shockingly good, but Ladurée is just the original. Ladurée means: the invention of the macaroon. But above all it remains an aesthetic experience to visit one of their Parisian shops and coffee houses. Have a look at the window: This is already art. Walk in and you will have the impression that Marie Antoinette will soon come round and devour hundreds and hundreds of these tiny cakes, crisp on the outside, smooth and soft in the middle, these indescribably beautiful double-deckers, existing in all flavours and all the colours of the rainbow. Since Sofia Coppolas movie “Marie Antoinette” the macaroon has become something mythical and well known beyond the borders of France. 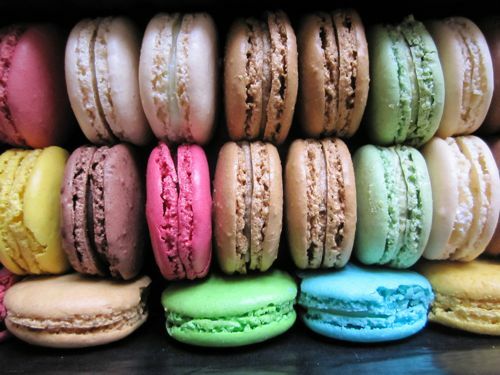 How many of you have fantasies about the macaroon? A lot, I guess. And you’re right. It is indeed the most refined sweets you can imagine and has nothing to do with the chewy coarse thing made of shredded coconut that Americans or Germans for example understand by macaroon. 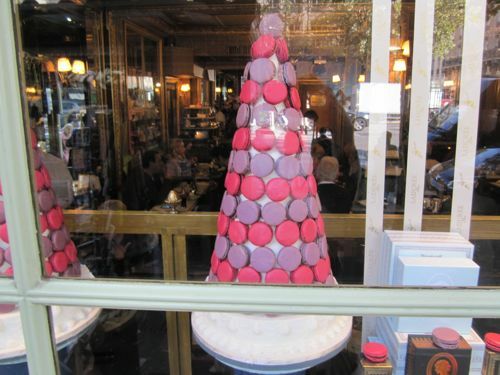 The real French macaroon is something that belongs on the list “100 things to do before I die”: Go to Paris, head to rue Royale and taste the epitome of elegance and luxury. But with the price of 1,50 Euro per macaroon, the sin has it’s price. And don’t go for the over-the-top-flavours like liquorice, lily of the valley or spice and soft fruits. Stay on the beaten track when it comes to macaroons and try chocolate, coffee and – the top of the top – caramel with salted butter. I tried several times to prepare these little wonders myself. The third time they weren’t bad at all. But I have still a long way to go to reach the aesthetic perfection of Ladurée. Do you know how many macarons they sell? Fifteen thousand every day. Don’t calculate how much money they make. Just close your eyes and imagine the incredible texture with an incredible taste.